January 22 is the feast of St Wendreda, an obscure East Anglian saint about whom very little is known. Her name suggests she was an Anglo-Saxon woman, but that's pretty much as far as we can get. She is associated with the town of March, to the north-west of Ely, where she may have been head of some kind of community; the church in March is dedicated to her, the only church to bear that dedication. If she can be identified with the St Mindred to whom a well is dedicated at Exning, she may be connected to St Etheldreda of Ely and the East Anglian royal house, and if so she would have lived in the late seventh or early eighth century - or she may not, in which case she didn't. She doesn't appear in any medieval calendars, so January 22 may not have been her original feast-day, if she had one; but they celebrate her on this day at Ely Cathedral, and that's good enough for me. 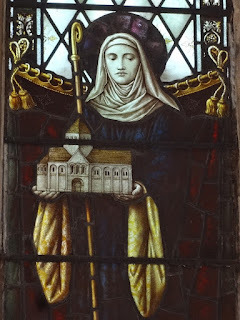 Although so very little is known about St Wendreda, there is one fact about her which is actually very topical this year, the 1000th anniversary of the Danish Conquest of England. During the reign of King Æthelred, probably in the first decade of the eleventh century, the relics of St Wendreda were acquired from March by the abbot of Ely and placed in a gold shrine in the abbey church. At that time, as you will know if you've been following my series of posts on the anniversary of the Danish Conquest, England was under sustained attack from a number of Viking armies, the most successful of which was led by the Danish king Svein Forkbeard. In 1013 Svein drove Æthelred into exile and became king of England, but died after a few months, the victim (later legend said) of the vengeful spirit of St Edmund of East Anglia. After the deaths of Svein and Æthelred the war was carried on by their sons, Cnut and Edmund Ironside, who fought a succession of battles across the south of England in 1016. When Edmund Ironside met Cnut's army for the last time, on 18 October 1016, at a place in Essex called Assandun, the monks of Ely carried the relics of St Wendreda to the battlefield in the hope they would bring divine aid to the English side. In the years leading up to 1016 East Anglia and its powerful monasteries had put up a spirited defence against the Danes (as they were to do against the Normans, a few decades later). Ely provided support to the East Anglian army who fought against the Danes at Maldon in 991, and after the battle it was the monks of Ely who recovered Ealdorman Byrhtnoth’s body from the battlefield and buried him; it may well have been a monk of Ely or a neighbouring monastery who composed the Old English poem which commemorates the Battle of Maldon, which has made Byrhtnoth and his men a symbol of Anglo-Saxon resistance against the Vikings. Another casualty of the Danes, Byrhtnoth’s son-in-law Oswig, killed in battle at Ringmere in 1010, was probably buried at Ely too. 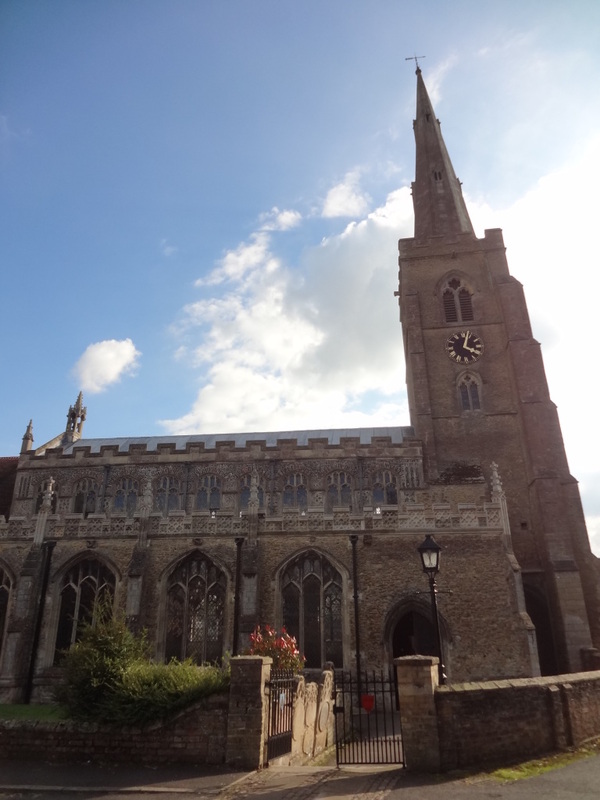 So it's not surprising that the monks of Ely took their relics and their prayers to help Edmund Ironside at Assandun (especially as the battle may have been fought near to one of the abbey's Essex estates). They were not the only monks on the battlefield: the abbot of Ramsey Abbey, Wulfsige, was there too, as was his predecessor Eadnoth, Bishop of Dorchester. Both were killed in the battle, along with eall seo duguð of Angelcynnes þeode, 'all the nobility of the English nation', as the Anglo-Saxon Chronicle puts it. The twelfth-century Liber Eliensis, our source for this information, calls Eadnoth a martyr, and says he was cut down by the Danes as he was saying Mass on the battlefield. 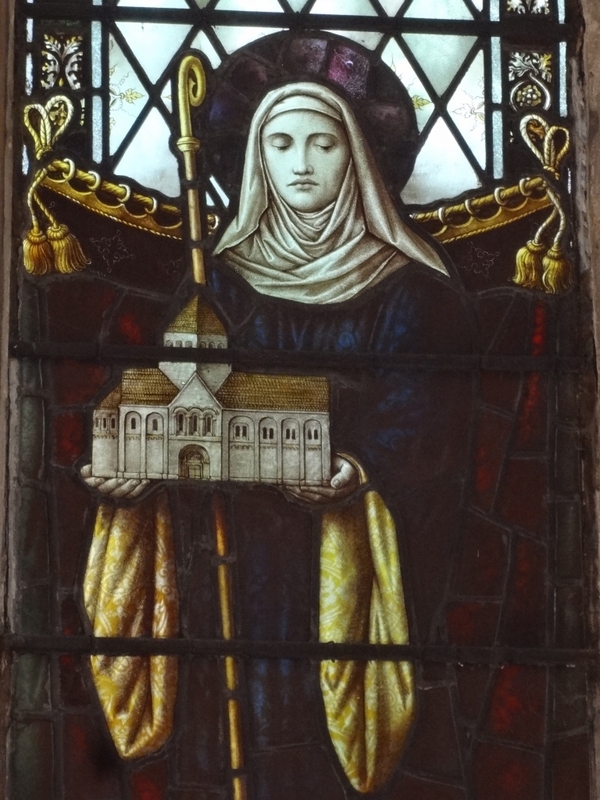 If St Wendreda's relics had managed to save England from conquest, she might not today be quite such an obscure saint. But unfortunately (or not, depending on your view) the relics were unsuccessful, and the English were defeated. Not only did Cnut win the battle - and six weeks later, on the death of Edmund Ironside, the whole kingdom of England - but he also captured Wendreda's relics: the Liber Eliensis says that the Ely monks believed Cnut took the relics from the battlefield and subsequently gave them away to Canterbury. It's hard not to think Cnut had bigger things on his mind at the time, what with having just conquered a kingdom and all, so perhaps he doesn't personally deserve the blame for this, but it might conceivably have been intended to punish Ely for its longstanding opposition to the Danes. But he never returned the relics of St Wendreda. The relics did eventually come back to March, some three centuries after Cnut's time, but their whereabouts are now unknown. 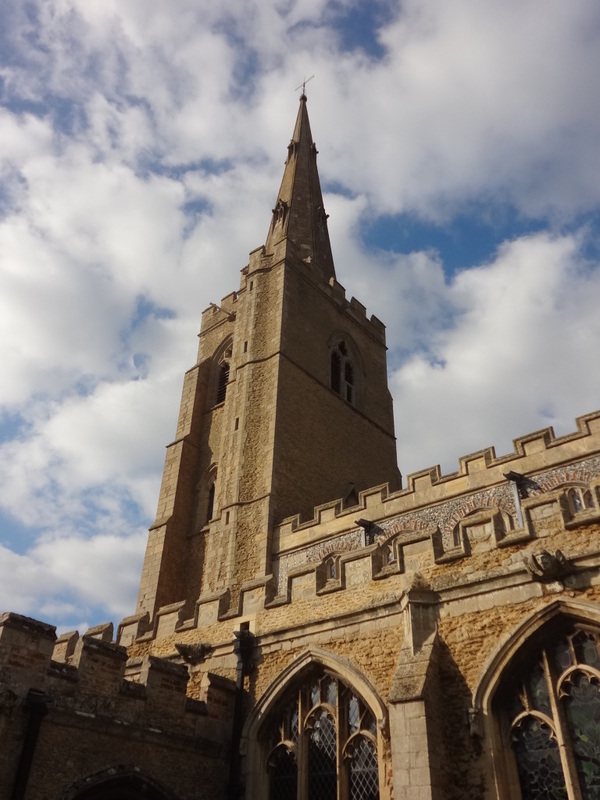 If the name of St Wendreda is familiar today, it's not for her own sake but because of the fabulous church in March which bears her name. 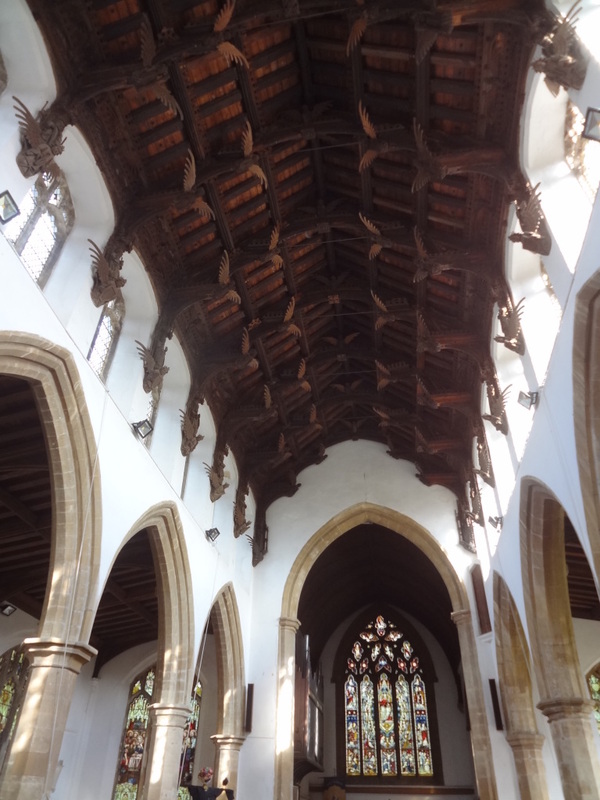 The church is famous for its stunning medieval roof, which is adorned with squadrons of angels - 120 of them, winging their way across the beams. It's an astonishing sight. Above is a not very good picture of it I took in haste a few months ago, but have a look at this site for more and lovelier photographs. St Wendreda's intervention didn't do much for the Angles at Assandun, but her angels are above reproach. Learn to love as I love thee. To thee me take and hold. And that grieveth me sore. And keep thee from the cold. Than man should lose heaven's bliss. Thou must ransom him thereto. Thy sweet will be done. To live for evermore. Amen. One last Christmas poem. 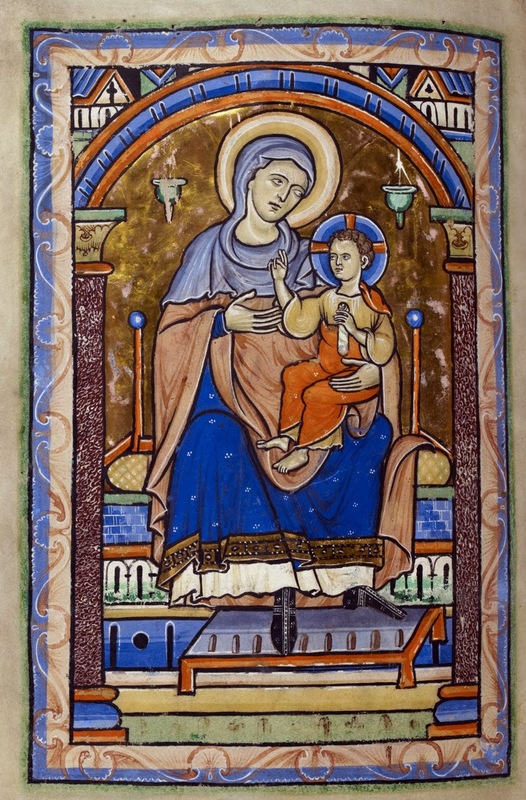 This is a version in modern spelling of a fourteenth-century poem (the original can be found here) which imagines a dialogue between Mary and the infant Christ. It comes from a manuscript which belonged to a friar called John of Grimestone (the manuscript is now Edinburgh, National Library of Scotland, Advocates Lib. 18.7.21; the first three verses also appear in British Library, Harley 7322). 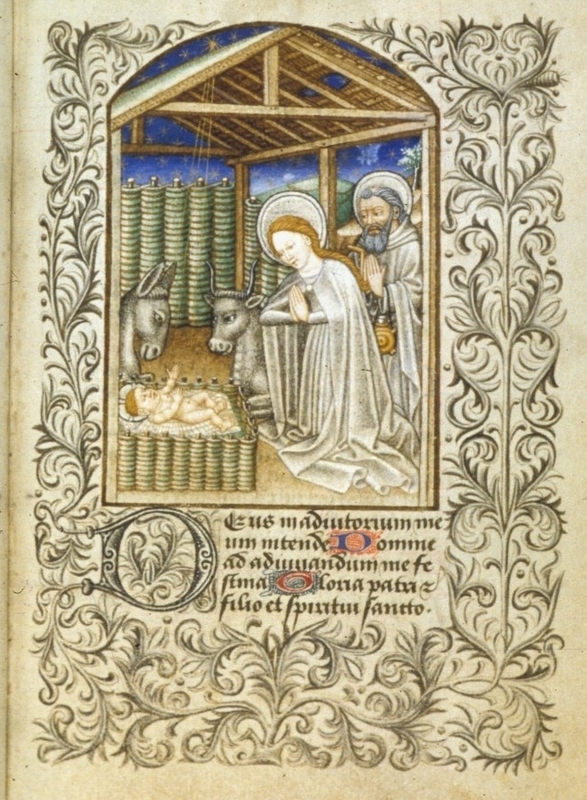 His manuscript, which dates to 1372, is a collection of preaching materials, containing a large amount of English verse and including several tender poems about the baby Christ: 'Lullay little child, rest thee a throwe' is especially lovely, as are 'As I lay upon a night' and this lullaby carol. Although it focuses on Christ's death rather than his birth, Grimestone's 'Love me brought' also has some parallels to this poem. 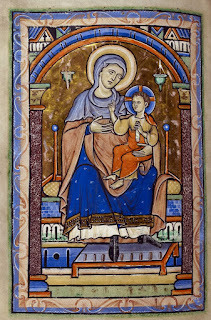 Long-term readers of this blog will know that I have a soft spot for Middle English lullaby carols, especially ones in which the baby and his mother talk about his future, the suffering both will face before his work on earth is completed. I always feel - perhaps this is excessively literal of me - that these poems are more fitting reading for the weeks after Christmas than for the day itself. 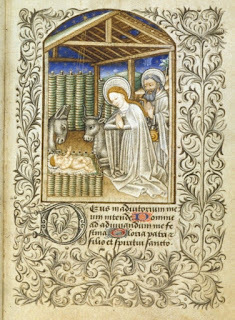 They look forward, turning the reader's attention from Christ's birth to his future life, while being careful always to evoke the naturalistic details of their setting in his first newborn days: makeshift cradle, anxious mother, a baby to be fed, wrapped, soothed, sung to. This one is not a lullaby, though the lulling ls of its first line might bring the sound to mind, but the speaker of all except the first verse is Mary; the fact that the verses are all dialogue makes it possible for the reader to take on her voice, to feel and to plead with her. 'Learn to love as I love thee', she, and we, are told.